In our driven, multi-tasking culture it’s so, so hard to rest. But what if rest is the key? What if rest, not work, is just what you’ve been looking for to find your way back to your truest, God-created self? It’s not just possible to bring God great glory in rest, it’s actually a requirement. 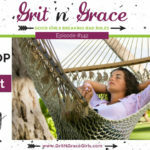 Cheri and Amy process their struggles with rest and share what they’re learning through a few simple practices. 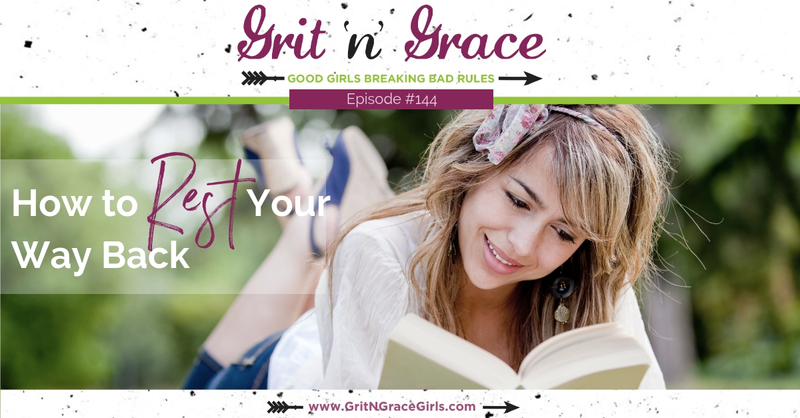 Rest just might be what we reforming perfectionists and people-pleasers need most! How do I experience a resistance to rest? When I do choose rest, what gifts do I find there? 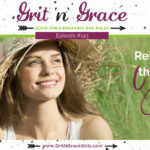 How does choosing rest unleash God to work in my life? Amy: Cheri, when we interviewed Michelle, you quoted her, and you said, part of my inability to sit still and quiet in the time … whoops, sorry. Part of my inability to sit still and quiet in the in between times was my relentless drive towards efficiency and productivity. And it was funny ’cause you asked Michelle the question, but I think that quote resonated with you a lot, so tell us about that. Cheri: You know, when she talked about the inability to sit still, this is literally true for me. And I noticed it just last night when Daniel and I sat down to watch a Christmas movie together. And I always think in my head this is gonna be such a great idea. I’m gonna snuggle up to him and we’re gonna have this romantic time together. And about five minutes in, I get the wiggles. Like, I can’t sit still. I’m like, physically incapable of it. I was thinking back almost 33 years ago now when we started dating, and I wanted to cuddle ’cause he was so handsome and so hunky, and I wanted to have this romantic time with him. And I would be like … I would clench my fists and grit my teeth to try my best to just stop and be able to just lean my head on his shoulder and hold his … And it is, even all these years later, it is so hard for me. And so one of the things I’m recognizing for next year is that this word rest is … I did not pick my word for the year, like, it has been given to me in big, bold letters. I’m like, where’s the return policy on this word? Is there a receipt, a gift receipt? And it’s like, no, there’s no gift receipt. It has been delivered. It is just so hard for me to actually, actually rest. And so listening to Michelle talk about it and realize it’s a practice, it is something that it’s not either you’re good at or you’re not good at. And I think I’ve excused myself for so many years. Well, I have a certain temperament. I have this type A temperament and we don’t rest well. We’re on, we’re off. And the way she spoke about learning to sit and go into a state of rest was really challenging to me that this is a learnable skill. I don’t actually get to make the excuses that I’ve been making for all these years. Yeah. Amy: Well, just for the past few days, I have been experimenting with her idea of setting a timer for five minutes. Cheri: How’s it going? You’re still alive. Amy: It’s awesome. It’s awesome and it is so hard. It is so hard. You know, I think our culture has really bought into this idea of multitasking, and from what I understand from brain science is it’s really not possible, that we think we are, but we’re really not paying attention fully to anything. And I feel that so much when you talk about not being able to sit still, I feel like that has been exasperated by my phone. So, even if I sit down to watch This Is Us, the blessed show, I will have my phone sitting on the back of the couch. And so the second the commercial comes on, I’m scrolling Pinterest or something. I mean, it’s like, there’s just no margin. So even sitting for five minutes and trying to be still and to still my thoughts is so difficult, but I’m telling you, it feels so good too. It’s amazing. Cheri: It it a little bit like hitting yourself on the head with a hammer, it feels good when you stop? Just asking. Just wondering. Amy: Well, I’m just … wow. It’s interesting, because it’s funny when I’m silent, God actually speaks. It’s kind of a revelation. Cheri: What can I say? I’m gonna just look through real quickly to see if I put something here that I had thought of, and if I hadn’t, this would be a good place for me to put it. See, my entire problem is that I can’t see. I really should do this on the computer where I can just … Yeah, okay. So, one of the things that happened after our interview with Michelle is our women’s group has been going through a Bible study on 1st Corinthians. And in the margins on … I guess it doesn’t really matter what day it was. One of the things that happened after our interview with Michelle was I was in our women’s group, and we were talking about keeping it simple, keeping God’s truth simple. And as I was watching the video and kind of taking notes, I was thinking about one of the chapters in Exhale, our book which is coming out next year. No. One of the chapters in Exhale, in which I kind of came to the conclusion that for those of us who are kind of type A, we need a word for what it means to not do things. Like, we need a verb for not-ing, N-O-T-I-N-G. We need a verb for that. And by the end of the chapter, I had kind of recognized that the word for that is trust, and trusting, and I thought that was a good point. But after talking to Michelle, what hit me is there’s a … I won’t say better word, but there’s an accompanying word. The way I know that I actually am trusting God is if I am being still, if I am actually resting, if I am actually able to sit in the quiet and not keep reaching for whatever it might be, the phone or whatever. And so, that really hit me hard that I say I want a word for what it means to not be doing all of these things, but when I figure out what that word is, it feels either … it feels irrelevant. You know, we’ve said this before. I’ll rest when I’m dead. Who has time to rest? We just dismiss it. Cheri: And yet, resting is a demonstration of how much trust … My ability to rest demonstrates my trust for God. Whew. Amy: Whew, that’s amazing. Michelle talked about two different reasons she thinks that we stay so busy. One of them is she called it a numbing device. I was sort of stunned by that. How have you experienced busyness as a numbing device? Cheri: Our connection’s breaking up, Amy. I can’t hear you very well. Cheri: No, I’m totally joking. Amy: I was about to hang up and let you call me back. Amy: Cheri, come in and answer honestly. Cheri: Oh my goodness. Yeah. You know, what it is is I want reactions out of people, and I want to know that I matter. And so, I’m busy … I know we’re joking about using our cell phone, but there’s so many ways that we can do this, and I think this is where technology really does tap into that addictive quality, because it gives us instantaneous feedback, which our real face to face relationships often don’t. And so we can check Instagram and see how many people liked a picture, or we can check an see who left comments on a Facebook post, or whatever it is. And that will numb my loneliness, or that will numb my feeling of distance from a person I’m in conflict with in my real life. And that conflict feels really hard to fix, but I can post a picture of Rafiki and feel really good for a moment. I’m not saying the picture or Rafiki is bad, but that need to numb is the thing that’s gonna be tough. How about you? Did that resonate with you in any way, shape or form, or is this just Cheri laying down on the couch being psychoanalyzed again? Amy: No, it absolutely is true. And I’ve talked about this in the past that I often realize that I’m using reading as a numbing technique. Reading loos like rest, but it’s actually keeping my mind focused on something else other than what I want to think about. And it can be a numbing technique for me. Cheri: Yeah, there might be something underneath there that I can’t fix, so who wants to see something you can’t fix? I mean. She also said … no, no, this is me asking. Nevermind, sorry. Amy: Well, and can we talk about Enneagram here for just a second? Cheri: Oh my goodness, yes, please do. Amy: Okay, ’cause our listeners, for our listeners who … lots of you probably have been reading and listening to podcasts about and all kinds of things, Enneagram seems like the personality test of the moment. What do you think about Enneagram, personality girl? Cheri: I think it’s fascinating. I mean, I’ve listened to podcasts, I read a couple of the books on it, I have taken the test enough times to turn out being a one, a two, a three, a four, and a six. But I can’t ever quite make myself a seven. How about you? So sure enough, I was listening to a podcast with the guy that wrote The Road Back To You, and he was interviewing a woman who was a one that I was like, oh my gosh, do you live in my head? And she was describing the perfectionist. I was like, here we are again. And I have to tell you, I kind of grieved over it. In fact, I majorly grieved over it just last night because there’s this situation where it once again, this woman who’s been interviewed called we ones improvers. Amy: And she made the comment that her husband has said, “When you walk in the house after you’ve been gone for an hour, like you may not speak for 30 minutes.” Because what she would do is exactly what I do. Walk in the house, and all I see … I’ve been gone for an hour, I’m like, how is this place such a wreck after an hour? And all I can see is the crumbs on the counter and the peanut butter left out, and whatever mess my people have made. And so she called us the improvers, like we’re always … that’s what our eyes go to first, the thing that needs fixed. But the downside of that, of course, is that I can be super negative. I can be really critical. And I have kind of fallen into that trap in a situation at my church, ’cause our church has just lost our pastor, and it’s just a painful, painful time. But I realized I’ve fallen into that pit of negativity and critique. But so sitting in the quiet and realizing those things about ourselves, it’s not all butterflies and rainbows stuff, like I’m so great, right? This is the painful part of facing our truest self, and then begging God to do something with that mess. Cheri: Well, and I’ve landed on two being my Enneagram, and that’s the helper. And it sounds so good and so sweet, until I realize, oh, it’s also the meddler. It’s also the person who sticks her nose where it doesn’t belong, and then feels horribly underappreciated and is just equally impossible to live with. So, yeah, yeah. These all have their beautiful sounding strengths, but in my case I keep trying to fix other people, and then I go to those numbing things when I fail, instead of resting and letting God work on me. Because we hear, “Well you can’t change other people, you can only change yourself.” And you know, there’s just a part of me who’s like, whoever said that just didn’t try hard enough to change other people. They just really didn’t. Amy: They weren’t as good at it as me. Cheri: Yeah. Unfortunately, the only change I make is I make it so they really don’t want to be around me. That’s not the change that I was really aiming for. Cheri: Oh, where are you? Amy: I might have skipped down too far. Cheri: Okay, so just read it. Amy: Okay. I was fascinated when Michelle said that she thinks desire has gotten a bad rap in the Christian community. Do you see that as true? Cheri: Hang on a second. Cheri: I’m just trying to figure out where … So how about, let me ask that one, ’cause you have something to say about it, and I’ll just work off of that. Cheri: Michelle said that she feels like desire has gotten a bad rap in Christian circles. So, where do you see that to be true? Amy: I think that is definitely true. I feel it in my own life so much. An example came up recently. I’ve been going to this Bible study that I absolutely love on Wednesday nights, but I’ve missed a lot because I’ve been on the road a lot. I’ve been traveling a lot. So, because I’ve missed a lot, I felt like I couldn’t miss again on Halloween night. And I had this tearing in my soul about that, because before I realized that Halloween was falling on Wednesday night, I had made plans with a neighbor of mine to sit at the end of my driveway, both of our husbands were gonna be gone, and we were gonna sit at the end of our driveway and just pass out candy to kids and chat with neighbors and enjoy. I was looking forward to it so much. But when I realized it was on a Wednesday night and I had already missed this Bible study so many times, I felt the obligation of going to the Bible study, even though I love the Bible study. Does that all make sense? Cheri: Oh yeah. Yeah, yeah. Amy: But I realized that this has become a pattern in my life, that I choose the obligation. I sit at my desk and work past when I should work instead of taking the walk on the beautiful fall day. I do the thing that I’m obligated to. And then in the process of understanding all that, I realized that I have again fallen into this artificial divide between the sacred and the secular. And there’s no such thing. God owns it all. And maybe the more spiritual thing would have been sitting at the end of my driveway talking to my neighbors that night than doing the church girl thing and going to the Bible study. I don’t know. But it was just that wrestling with what my soul wanted I saw as bad, and what I thought I should do was the good thing, and the God thing. Cheri: It sounds like you played it safe. Amy: I think so. I think so. But I also, I defaulted to church girl. And the good thing is not always the God thing, you know what I mean? Cheri: Yeah. No, it’s true. Amy: Or the thing I think is good, that I’ve labeled that way. Cheri: Yeah. You know, when it comes to desire, I feel like yes, I have desires that I know God has given me, but I can so quickly let them get out of control and go from a true God-given desire into something that is taking on a life of its own. And then at some point, I look at it and I’m like, oh, this is way out of the bounds of anything that God has called me to do. And rather than recognizing that the problem wasn’t the desire, the problem was my failure to rest and be still and listen and take it at a pace that involved actually following God’s leading, rather than coupling a God-given desire with my need to numb. It’s like, okay, so here’s this thing God has called me to do, and here’s all my loneliness, or here’s my desire to procrastinate some other project that’s no longer fun. And so it ends up being this incredible mixed motives. And so what I end up distrusting when I look back at something like that is the desire. See, I should never have done that thing. See, that’s proof that following my bliss or following my heart, or any of these other phrases that we use, it always gets me in trouble. I should have just done the logical thing. I should have done duty over desire. And they aren’t necessarily opposed to each other, it’s the way I do it, by letting myself go in so fast and go heading off in my own direction. And for me, I can tell it’s happening because there is this kind of frenzied quality to it. I mean, I’m a starter. You know this from working with me now. I love new ideas. I love starting things. And it’s so easy for me to just kind of peter out around the 80% done line, and so that’s how I know that I’ve kind of taken over an area of desire and just kind of hijacked it myself. Whereas if it’s something that God has really called me to, if it’s something that’s a true desire of my heart that He’s given me and I’m supposed to be following Him on, it’s gonna be at His pace, and we’re gonna make it across the finish line. Amy: That’s interesting, because what you’re saying is the pacing is what keeps it from being all or nothing. Amy: That’s really important. So, duty and desire aren’t mutually exclusive, but they can be combined if we do it at the right pace. That’s profound, Cheri. Can you think of specific examples that people might be able to apply? Cheri: You know, one of the things that I realized a number of years ago is that I have kind of a signature style about the way I do things. I mean, we’ve talked in the past about personal branding. And one of my signature styles is I have this kind of snarky sense of humor. But for way too long, I just kind of … if something felt too much like a duty, I would just slog through it. And so I’ll just use teaching as an example. If it was a lesson I wasn’t that excited about or whatever, I just … back to all or nothing, it’d be like, here’s the worksheets, and we’re just gonna make it through. Whereas it was something I was really excited about, something that felt much more fun and exciting, then I would throw myself into it. And I finally realized everything that we do is an opportunity. Everything I do is an opportunity for me to bring my signature style to it. And so even those boring assignments, I could’ve lightened them up with a good joke. I could’ve lightened them up with just a little touch of my signature style so that even if the topic wasn’t the most exciting thing in the entire world, the lesson that we all experience together as a class for 50 minutes could have had that touch to it. And so for me, remembering even if it’s quotes, “a duty,” I don’t want to save my being myself. I don’t want to save this signature style only for the delight and the desire, I want to be practicing it all the time, and be bringing that into all of my relationships. Because I know I do, and I’m gonna guess some of our listeners do, is we kind of wait for the big break, or we wait for the big event. We wait for the relationship that matters. And you know, it’s kind of … what I’ve been hearing God calling me to for several years now is slingshot practice, that I need to be David watching, tending the sheep, and every day needs to be slingshot practice. Because if the giant shows up in my life, if that big event shows up, if that big opportunity shows up and I haven’t been practicing being myself, that’s the analogy here to slingshot practice. If I’ve been just waiting and waiting and waiting, I’m not gonna be ready for it. I’m not going to be … If I can’t bring that sense of delight and that sense of desire into my everyday duties, then it’s not going to just magically show up when those bigger, supposedly bigger opportunities happen in my life. Amy: I love that, and I hadn’t seen that trend in our interviews of personal brand and signature style, and now Michelle says it as true you. So, that it’s all an overlap, and it’s about bringing that to every part of our lives, to live integrated lives. I mean, it really kind of goes back to that there’s not a separation between sacred and secular. There’s not a separation between when I’m myself and when I’m not myself. This is all supposed to be integrated into who we are and the way we live. Cheri: And the key to all of it, unthinkably, unimaginably is rest. It’s not striving. It’s not going full speed ahead. It is making sure that we’re going at the pace God is leading, rather than what comes so naturally for the most of us who are over attempters and reforming perfectionists. Amy: I was thinking about something I read this morning, but that’s okay, I won’t bring that in. Cheri: All right, anything really, really important here that we missed? I feel like we could start wrapping up. Amy: I know. Let’s see. Cheri: Yeah, I think we’re good. Amy: Okay. All right. Do you want to say anything about the HSP piece? Cheri: I don’t think so. 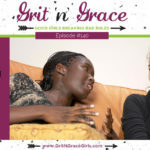 Cheri: So what scriptures are we pairing with these episodes with Michelle? And there are two of your words in there, Cheri, rest and trust. They really do go hand in hand. Cheri: So, what’s the bad rule for these episodes. Amy: I work my way to my truest self. Amy: Yeah, she taught us so much about how that’s not true. So much the work and the busyness leads to numbing and avoiding our truest self. It’s a way to avoid. But instead, the truth for focus is I rest my way to my truest self. Cheri, that makes me really excited about your word for the year. I think you should be journaling all this. Amy: I love number 10, or whatever it is for you. Cheri: Goodie goodie gumdrops. I’m so glad it makes you happy. I am resisting this word. Oh my goodness. Well, and for me, the grit in all of this comes in a word Michelle referred to. She said that God calls us to name our brokenness, and I think the grit for me in all of this is going to be to rest. And she also said that God asked her this question about why she avoids intimacy. And so all of that sounds … brokenness and intimacy and resting with a God who asks those kinds of questions, hello … all of that sounds like it’s going to take a lot of grit to rest, to be still, to take time in the quiet, and to have that level of honesty and candor with God. 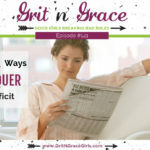 That’s gonna take grit on my part. How about you, what’s the grace piece? Amy: Well, and the grace for accepting my truest self is that the truth is is that I’m human. And what it means to be human is that we are made in God’s image and that is glorious, and we are fallen and sinful, and that is horrible. And we are both. We are both the good and the bad. And because we’re human, that is just the way it is. 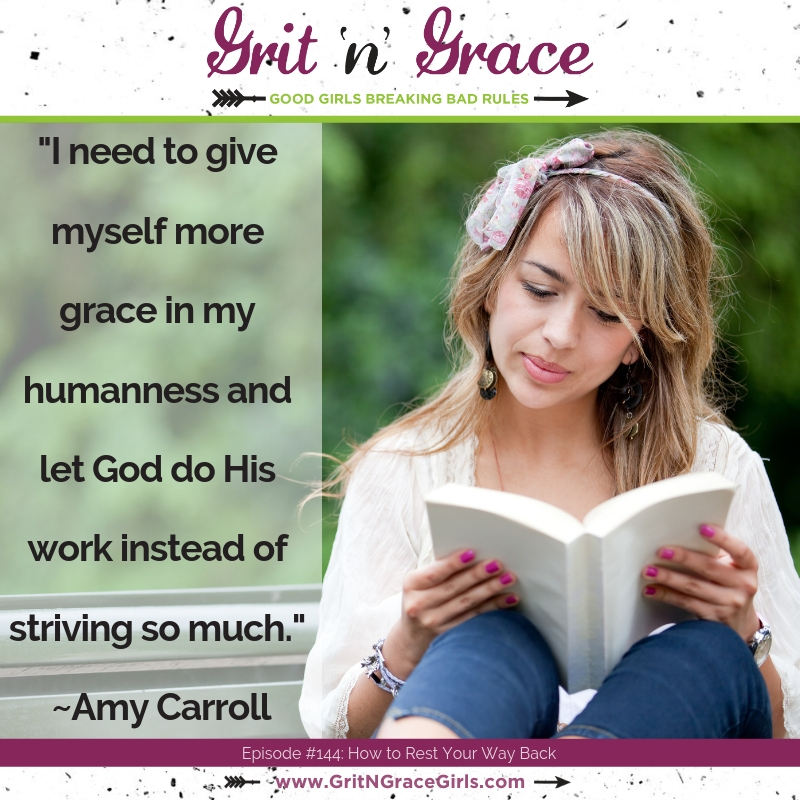 And it’s not that I accept the bad, but I just don’t have to … The improver in me does not have to set upon myself on a regular basis, that I need to give myself some more grace in that humanness and let God do His work instead of striving so much all the time to change. Take-Away for Today: I rest my way to my truest self.